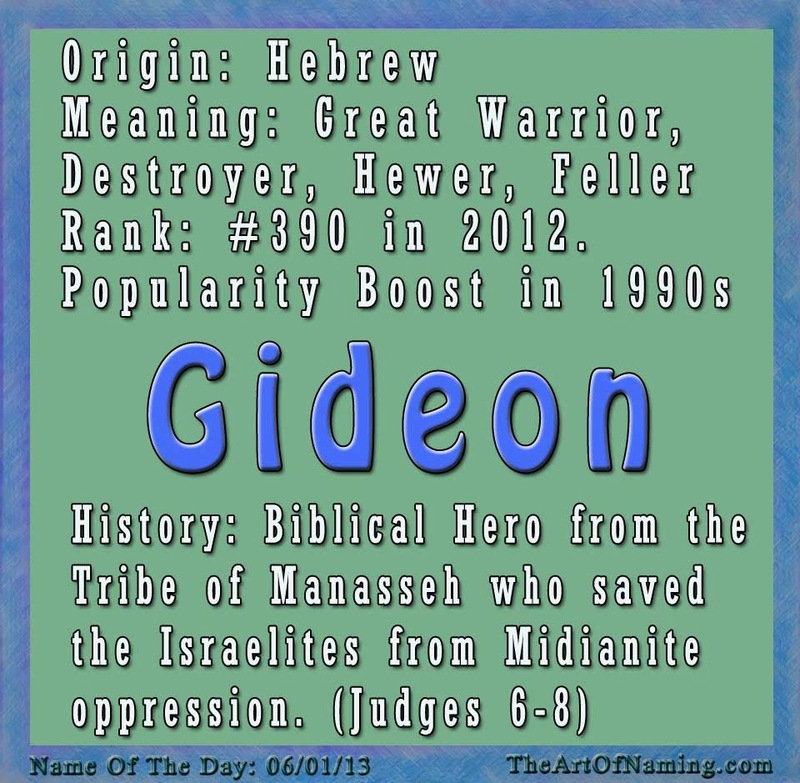 The Name of the Day for June 1, 2013 is Gideon, a boy name taken straight from the pages of the Old Testament. Biblical Gideon was known as a modest and humble young man of the tribe of Manasseh. With the help of an angel, he was divinely called upon to save the Israelites from Midianite oppression. Before he could do this, he had to be tested to prove himself worthy for battle. God asked Gideon to destroy his father's alter to Baal and to cut down the sacred pole that stood with it. 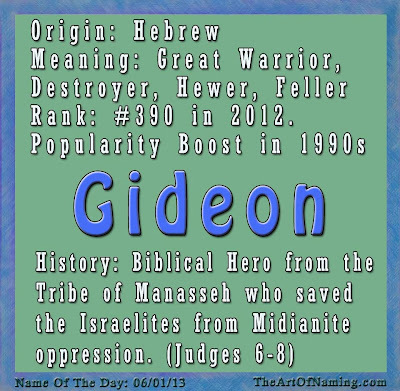 For this reason, the name Gideon means "Destroyer" or "Feller [of trees]" or even "One who cuts down". It may also mean "Hewer" or "Great Warrior", depending on where you look. 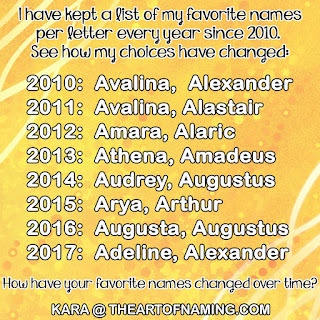 Many parents opt for biblical names for their sons, but for those who are tiring of the traditional Benjamin, James or Jacob, Gideon offers a fresh approach to naming. This name has began climbing the charts in recent years. It was always rather popular among the Puritans of the 16th-18th centuries who preferred Old Testament names. You may hear the name Gideon and think of the Gideon Bibles in every hotel room across the country, but this isn't necessarily a bad association. They were named because Gideon symbolizes great work done by few people. He famously led very few men against a larger army and won. Take a look at this popularity chart. Gideon has been used since the US began keeping baby name records in 1880. However, there were several years that had single-digit births per year or none at all. It wasn't until 1912 that the name received regular usage and it finally hit triple-digit births in 1993. Gideon received a spike in popularity starting around 2000, and it currently sits at #390 on the US Top 1000 chart in 2012. 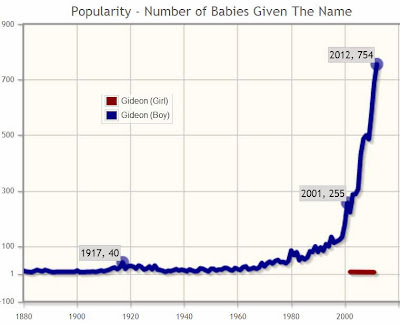 Perhaps Gideon is a name that you'd consider for your son. It certainly has a strong history and a positive, biblical association! What do you think of it? It is very handsome! I like that it is biblical. I agree with Lilah. Gideon's a handsome name!